Carambis Software Updater seems to no longer work. It will check for outdated software but won't display the download links properly. There are lots of other free program updating tools that you can use instead. 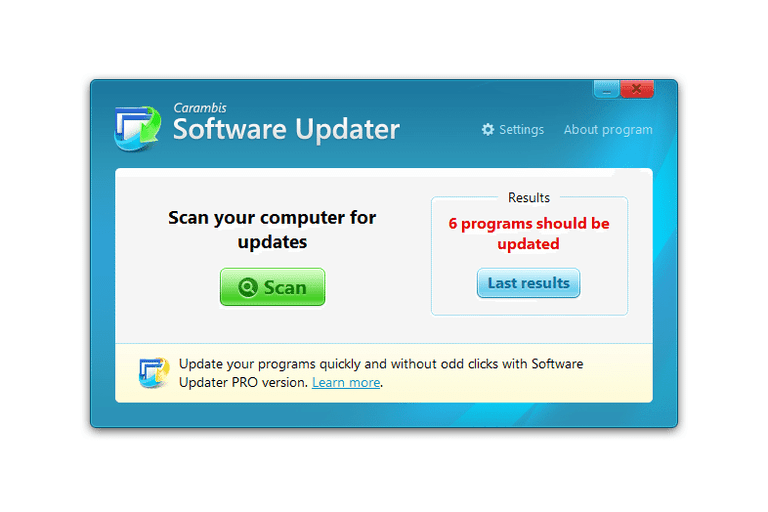 Carambis Software Updater is a free program updating tool that scans your computer to find software that needs updated. The results are displayed in your web browser, where you'll be given download links to update the applications. Carambis Software Updater is straightforward and easy to use, without any confusing settings or download pages. This review is of Carambis Software Updater version 2.0.0.1322. Please let me know if there's a newer version I need to review. Carambis Software Updater is very simple to use so it shouldn't be difficult to work with even if you're a novice. You just have to open the program, scan for updates, and then click the download links it gives you in your web browser to update your applications. Because there's a professional version of Carambis as well as this free one, several features seem to be missing, such as a download manager, direct downloads, and advanced scheduling settings. However, considering that Carambis Software Updater scans all your programs for you to find outdated versions, it's still better than not using a software updater at all, which would require you to check each download page yourself for an available update. While downloading Carambis Software Updater, you might be asked to install toolbars and make other unnecessary changes to your computer but you can easily skip over these requests... just pay close attention during the installation wizard. Pandora Recovery in Review: How Well Does It Restore Files and Data?